Herring may not be the most charismatic species in Puget Sound. They don’t breach dramatically out of the water. Fish mongers don’t throw them through the air at Pike Place Market. They find their strength in numbers, schooling around by the thousands and serving as food for other creatures like seabirds, salmon and seals. But if it weren’t for these small, unsung fish, the Salish Sea might be a very different place. 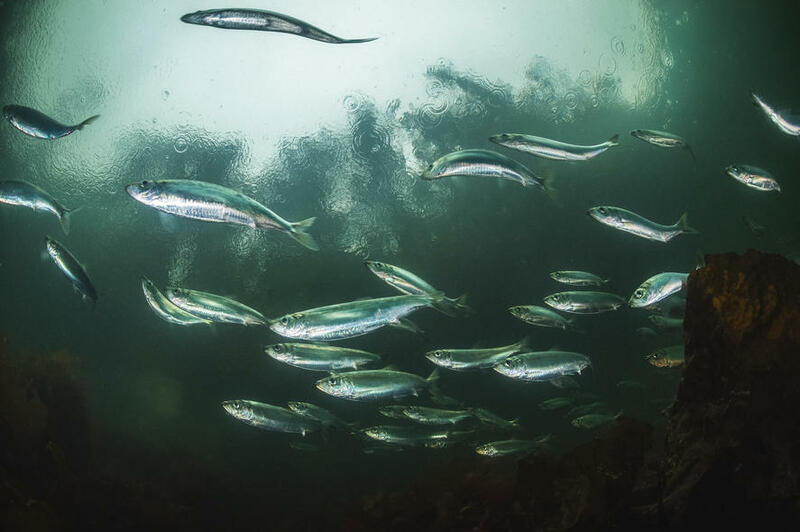 Herring and other so-called forage fish — named for their role as important food (forage) for other species — are foundational to the Salish Sea food web. They are so critical that the Puget Sound Partnership has identified them as a ‘Vital Sign’ for the health of the ecosystem. And that is why many scientists are worried. Some populations of Puget Sound herring are in dangerous decline. There are also major gaps in our knowledge of their ecology and life history. PSI’s Lead Ecosystem Ecologist Tessa Francis has embarked on three major research projects that could raise the profile of herring in the region. She is working with other scientists at organizations such as the Washington Department of Fish and Wildlife to pull together what is known about Pacific herring (Clupea pallasii), and to make recommendations for their conservation and management. She will also be venturing into the water to observe herring first-hand through monthly snorkel and SCUBA surveys. You can read about Tessa’s recent projects below. Pacific herring (Clupea pallasii) are an abundant and foundational species in the Salish Sea. Presently, monitoring, assessment, and management efforts treat Salish Sea herring as two separate groups: a Puget Sound herring stock, and a Strait of George herring stock. In 2017, building on her previous work to evaluate limits to Puget Sound herring recovery, Lead Ecologist Tessa Francis teamed up with Washington Department of Fish and Wildlife staff to evaluate the state of knowledge and provide recommendations on the conservation and management of Salish Sea herring. Francis and collaborators formed a trans-boundary technical team comprised of tribes and First Nations scientists, agency scientists, and university scientists. The team first collected leading hypotheses about the factors influencing changes in herring abundance and distribution in the Salish Sea. Those hypotheses, including shoreline development, contaminants and pollutants, food web changes were used to develop a conceptual model of Salish Sea herring, including key ecological connections and influencing factors. A public workshop was held at the Canada House of Western Washington University to review the conceptual model with additional experts from both sides of the border. At present, Dr. Francis is developing a Qualitative Network Model, based on the conceptual model and the workshop results, which can be used to test the relative support for different hypotheses about key influences on herring abundance and distribution in the Salish Sea. This work is funded by the SeaDoc Society and lead collaborators are Dayv Lowry, Todd Sandell, and Phil Dionne. Underwater eelgrass. Photo courtesy of Tessa Francis. In 2018 and 2019, Francis and collaborators will conduct monthly snorkel and SCUBA surveys at existing armoring removal sites, along with paired reference and armored sites, to monitor the effects of armor removal for subtidal habitats and species. This work is funded by a grant from the Washington Department of Fish and Wildlife, and conducted with lead collaborator Dr. Jameal Samhouri. Puget Sound herring spawning stock biomass has been declining locally over the past 40 years, including the San Juan Island spawning populations. Salmon in the area of the San Juan Islands have been found to be particularly reliant upon herring for prey. At present, while there are many hypothesized causes of herring declines, there is little agreement on the primary cause or, therefore, the best management or policy actions for recovery. Lead Ecologist Tessa Francis is leading a 3-year effort to address this gap in understanding through 3 primary activities: (1) convene an expert elicitation workshop to evaluate key threats to San Juan Island herring; (2) quantify changes in the abundance and distribution of eelgrass used as spawning habitat for San Juan Island-spawning herring using historical data; and (3) monitor herring spawning sites to measure early-life-stage (i.e. embryonic) mortality rate. Fig. 1. 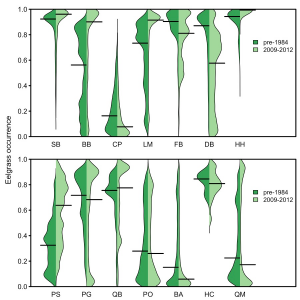 Site-scale changes in eelgrass area at herring spawning sites in Puget Sound. This project supports the analysis of these patterns in the San Juan Islands. From Shelton et al. 2017. In November 2017, Francis, with colleagues from the Washington Department of Fish and Wildlife, convened an expert workshop to evaluate hypotheses about declines in herring in the Salish Sea, including the San Juan Islands. At present, Francis is developing a Qualitative Network Model to evaluate the relative support for different hypotheses about what is causing herring declines. Habitat modeling, based upon a spatial model developed by NOAA scientist and PSI collaborator Ole Shelton, will be conducted in 2018. Field work is planned for the herring spawning season in 2019. 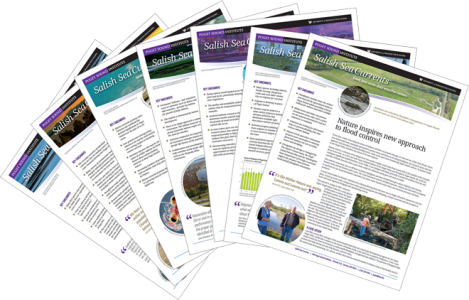 Funding for this project comes from the Salmon Recovery Funding Board (SRFB) through the Puget Sound regional allocation of PCSRF funds, PRISM project 16-1672. More information can be found here.